Lo stato mentale può influire sull’esperienza visiva cosciente. Vision, Touch and Hearing Research Centre, University of Queensland, St Lucia, Australia 4072. University of California, Berkeley, California 94720, USA. Figure 2. Frequency of respective disappearance intervals during motion-induced blindness for monks tested in the current study (red) compared to a group of 61 meditation-naive volunteers (blue). training over many years a point made recently at a forum between a selection of Buddhist leaders and distinguished scientists . Perceptual rivalries, such as binocular rivalry  and motion induced blindness , are being used to study the neural mechanisms underlying consciousness and attention [2,4], as they involve fluctuations in conscious awareness despite unchanging external stimulation. Tapping into the ability of Tibetan Buddhist monks to control the flow of items being attended to and accessing consciousness, we found that meditation alters the inherent fluctuations in conscious state associated with perceptual rivalry. 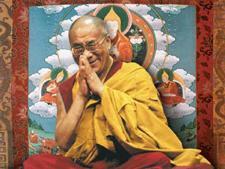 With the support of His Holiness the Dalai Lama, a total of 76 Tibetan Buddhist monks varying in experience from 5 to 54 years of training (including three retreatist meditators, each with at least 20 years experience in isolated mountain retreats) were tested using non-intrusive perceptual measures at, or near, their mountain retreats in the Himalaya, Zanskar and Ladakhi Ranges of India. Binocular rivalry was induced with head-mounted display goggles (Figure 1A) that presented horizontal and vertical green stationary gratings to the right and left eye, respectively (see Supplemental data available with this article online). In cases where coordinated button-press responses were not possible, verbal reports were recorded. Figure 1: Effects of meditation on perceptual switching. (A) Retreatist meditator wearing display goggles. (B) Proportion of monks reporting changes in rivalry switch rate during compassion (Comp) meditation, after and during one-point meditation (slower, light blue; faster, red; stabilization, dark blue; white, no change). (C) A representative frequency histogram showing phase duration (time between perceptual switch) for horizontal, vertical and mixed (grey) percepts after no meditation and (D) the same monk showing longer durations after one-point meditation. Harnessing the skills of highly trained monks to control their mental state, we report results from 23 monks corresponding to two types of meditation, approximately translated as compassion (a non-referential contemplation of suffering within the world combined with the emanation of loving kindness) and one-point (through the maintained focus of attention on a single object, the mind is calmed and the distracting influences of other internal and external events is reduced). Consistent with a recent study  linking different types of meditation with distinct patterns of neural activity, we found compassion and one-point meditation had similarly differential functional effects on the visual switching during rivalry. 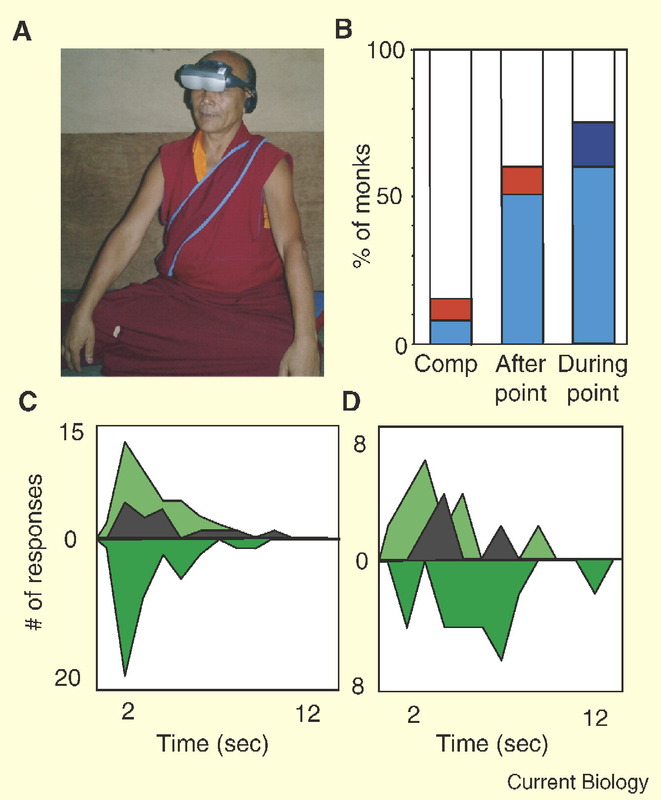 In contrast to compassion meditation, which led to no observable change in rivalry rate, one-point meditation led to extreme increases in perceptual dominance durations that were reported by 50% of monks after a period of one-point meditation (reports collected via button-press, as shown in Figure 1C,D, or verbally). Additional prolongation/ stabilization was reported (verbally) by the monks when they viewed the rivalry display during one-point meditation (Figure 1B). Within this group, three (including two of the retreatists ) reported complete perceptual stability throughout the entire 5minute meditation period. There was no consistent pattern in the dominant orientation favored. During periods of stabilization, the reported percepts often differed from either of the two presented gratings, with qualitative changes in depth, color and width. In some cases the perceptual dominance was complete; in other cases the non-dominant image remained partially visible. For example, one monk reported the stable dominance of the vertical gratings appearing as three-dimensional columns that were wider, brighter and closer than during normal viewing conditions. During this time the horizontal gratings remained faintly visible: set back in depth, they appeared thin and pale with a slight blue coloration. These results contrast sharply with the reported observations of over 1000 meditation-naive individuals tested previously. Because most of the monks served as their own controls by participating in the different meditation conditions, the finding that the increase in prolongation/ stabilization was specific to only one of the meditation types (Figure 1B) suggests that the effect is real, rather then simply reflecting miscommunication or a general incapability to perform the task. Furthermore it suggests that the prolongation of rivalry dominance observed results from the intense attentional focus and the practiced ability to stabilize the mind during one-point meditation, rather than the process of meditation per se. Volunteers were also tested on motion induced blindness prior to any meditation (see Supplemental data for details) and the mean disappearance duration reported was 4.1s (s.d. 3.9 s), compared to 2.6 s (s.d. 1.6 s) recorded from a group of 61 meditation-naive volunteers tested previously  (t = 2.8, p < 0.001) (Figure 2). The most extreme finding came from the retreatist volunteer with the most experience at meditation (25 years intense practice in mountain retreats). After a period of passive viewing he commented that he could maintain the disappearance indefinitely. So we suggested he attempt to actively maintain the disappearance and after recommencing, he reported the first reappearance of any of the three yellow target dots after 723s of sustained motion induced blindness disappearance! 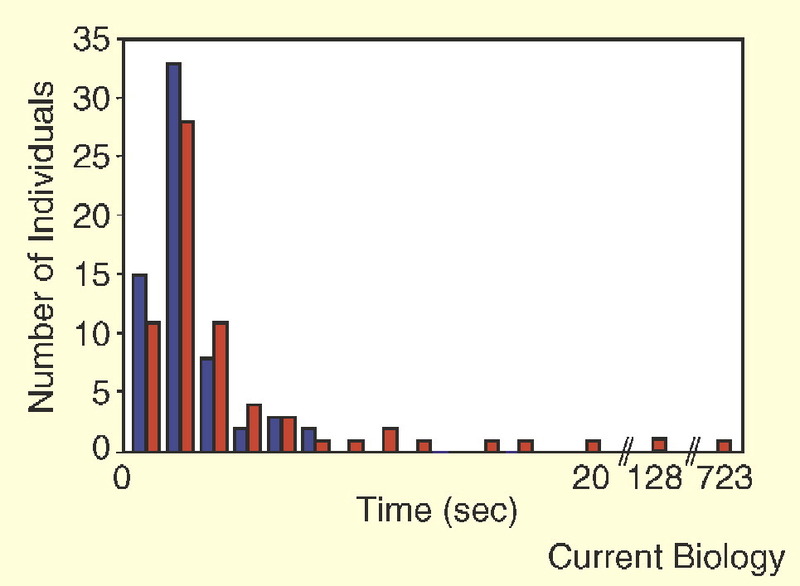 Figure 2: Histogram showing the frequency of respective disappearance intervals during motion-induced blindness for monks tested in the current study (red) compared to a group of 61 meditation-naive volunteers (blue) tested previously (for details see ). The two extreme values were not included in the statistical analysis reported in the text. The primary result of this study is that individuals trained in meditation can measurably alter the normal fluctuations in conscious state induced by binocular rivalry and motion-induced blindness. The meditation specific changes in visual function observed here provide new evidence in support of recent electrophysiological studies suggesting that different types of meditation and training duration lead to distinguishable short- and long-term changes at the neural level [5,7]. Furthermore, the reported association between focused styles of meditation and changes in neural activity in prefrontal regions of the cortex [7,8] regions that have been similarly implicated in sustained attentional  and binocular rivalry  supports claims of high-level, top-down modulatory effects in perceptual rivalry , and strengthens recent links between rivalry and attentional mechanisms . This study offers an initial contribution towards increased understanding of the biological processes underlying meditation and rivalry, while additionally highlighting the synergistic potential for further exchange between practitioners of meditation and neuroscience in the common goal of understanding consciousness. Acknowledgments This investigation was financially supported by the Heffter Research Institute, Santa Fe, New Mexico, USA, and a Stanley Foundation grant to J. D. Pettigrew. We would like to thank His Holiness the Dalai Lama for his support and help in facilitating the study, Tenzin Geyche and Tenzin Sherab for essential logistical assistance and Tsering Topgyal for recruitment of monks. We would also like to thank Tashi Choephel, Kelsang Wangmo, Ngodup Burkhar, Tenzin Sherab and Dorjee Dhondup who assisted with Tibetan and Ladakhi translations and the monks from the Institute of Buddhist Dialectics and the Namgyal and Thiksey monasteries for their participation.